With Roberto Orci recently vacating the director’s chair on Star Trek 3, it leaves a big opening in a valuable franchise, and we expect that there will be a number of high profile filmmakers vying for the job. We’ve heard a few names mentioned as possibilities, but one director, and Star Trek veteran, has thrown his hat into the ring and is going hard for the job. This individual is none other than Jonathan Frakes, better known to some of you as Commander William T. Riker from Star Trek: The Next Generation. That certainly would be keeping it in the family. 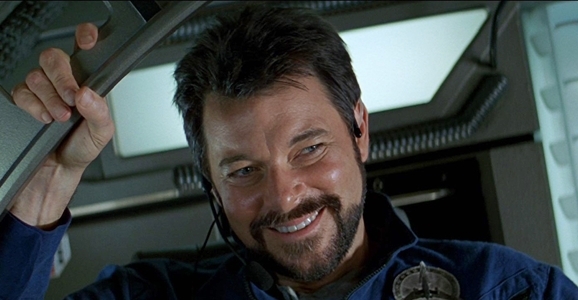 Talking to KOMO News in Seattle, Frakes said that not only has he already reached out to Paramount Pictures, the home of the rebooted franchise, via his agent. Beyond that, he has also personally contacted producer, and director of the first two installments, J.J. Abrams. There’s definitely no lack of confidence on his part, and when the interviewer says he’s already picturing Frakes at the helm, he said, “I am too.” You have to love the swagger, and he’ll probably need it if he has any hope of succeeding in his mission. While it may sound strange at first, at least to those who know Frakes primarily as an actor, he has a long directorial resume. Most of it is in TV, and he’s helmed things like Agents of S.H.I.E.L.D. and Falling Skies recently, as well as episodes of Trek shows The Next Generation, Deep Space Nine, and Voyager. This wouldn’t even be his first Star Trek feature, as he directed both Star Trek: First Contact in 1996 and Star Trek: Insurrection in 1998. Still, stranger things have happened in Hollywood, and what the hell, you see a shot you have to take it. There’s even a hashtag campaign going around to show support: #BringInRiker. While there has been a little talk about a successor to Orci, who will remain involved in Star Trek 3 in a producer capacity, Edgar Wright is by far the biggest and most exciting name. The idea of the Shaun of the Dead and The World’s End director working on a Star Trek movie has definitely raised a few eyebrows. He famously directed one shot in Star Trek Into Darkness and his pal and frequent collaborator Simon Pegg is a part of the franchise, so maybe this is possible. Right now it’s nothing more than hearsay and rumor from an unnamed source, but what the hell, we can dream big, can’t we? With production possibly beginning as early as February 2015, aiming for a 2016 release to coincide with the 50th anniversary of Star Trek, you have to imagine we’ll hear something before too long. Who do you want to direct Star Trek 3? Are you hoping for Wright, fully supporting #BringInRiker, or do you have someone else in mind? Jonathan Frakes would be the perfect director. I love this idea First Contact was by far the Best Next Gen Feature film arguably one of the best Features in the series, next to Wrath of Khan and Undiscovered Country, and Insurrection had all the comedic Beats that you want in a great Star Trek movie. Johnathan Frakes also directed some of the more memorable episodes in all of the Star Trek series. He clearly has a knack for it, I would give it to him. Which part did he direct in Into Darkness? It’s literally a single shot, somewhere during the Kronos sequence I believe. He said it’s like one shot out of something like 2200 in the film. Ohh so he didnt do anything really. While I love riker, if it is going to be ANYTHING like insurrection ..No thanks.